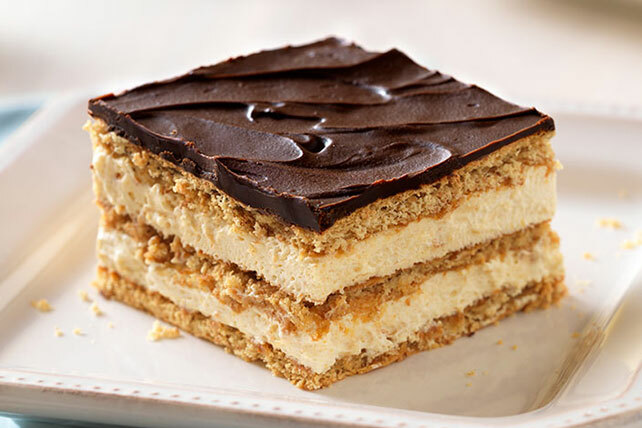 Discover a delicious peanut butter-chocolate éclair dessert made with graham crackers. This Easy Peanut Butter-Chocolate Éclair Dessert is a unique dish. Beat pudding mix and milk in large bowl with whisk 2 min. Add peanut butter; mix well. Stir in COOL WHIP. Layer 1/3 of the grahams and half of the pudding mixture in 13x9-inch dish, breaking grahams as necessary to fit. Repeat layers. Top with remaining grahams. Microwave chocolate and butter in microwaveable bowl on HIGH 2 min. or until butter is melted, stirring after 1 min. Stir until chocolate is completely melted and mixture is well blended. Spread over grahams. To easily cut the dessert for serving, use a sharp knife and dip the knife blade in hot water after each cut to warm and clean the blade. Prepare using 1 pkg. (1 oz.) JELL-O Vanilla Flavor Sugar Free Fat Free Instant Pudding, fat-free milk, reduced-fat creamy peanut butter and COOL WHIP LITE Whipped Topping. Prepare as directed, omitting the peanut butter.